Jaws is a masterpiece. Steven Spielberg’s second film (or third if you count the TV movie Duel) is one of those great wonders of cinema. It’s both a commercial blockbuster but character driven – it was born of the seventies sensibilities. It’s got the strangest structure of any major blockbuster in that it’s bifurcated, it basically restarts as a different movie halfway through but it’s stronger for it. Roy Scheider, Robert Shaw and Richard Dreyfuss star in this tale of a great white shark hunting the townsfolk of Amity, a beachfront community that makes its money through tourism. 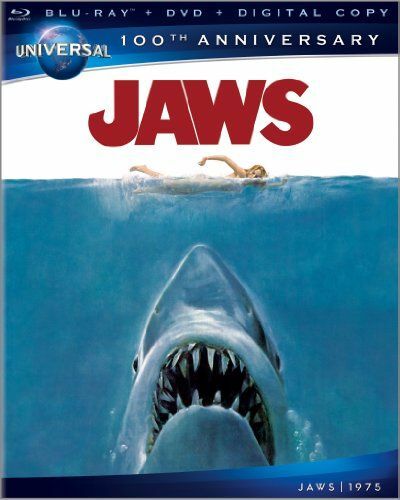 Our review of the Blu-ray of Jaws follows after the jump. The film begins with some teenagers partying on the beach. One guy sees a woman, and she dares him to go skinny dipping with her. But he’s so drunk he doesn’t make it in the water. She’s out by herself when she’s attacked by a shark. Chief Brody (Scheider) is alerted to the missing person, and when they comb the beach, the woman’s remains are found. But the mayor of the city (Murray Hamilton) doesn’t think Brody should close the beach, as he explains it might be a boating accident. But shortly thereafter Mrs. Kitner’s son Alex is attacked on the beach in the daylight. Mrs. Kitner puts an ad out advertising she’ll pay a $3000 bounty for the shark’s death. Around that time Matt Hooper (Dreyfus) from the Oceanographic institute comes to town and does an autopsy on the woman. It’s a shark, and probably a great white. Some hunters catch a shark, and the town thinks they’re safe, but Hooper is sure that it’s the wrong shark. They do some digging and Hooper is proved right, but that won’t stop the mayor. And when another attack occurs, they go to the person who said he could handle it in the first place: Quint (Shaw), a hardened fisherman who knows his sharks. This is where the movie restarts in its way. Arguably the film could be said to have a two act structure as the film is split in half, and the sequence on the boat feels like a new beginning. There Brody, Hooper and Quint look to find the shark where he’s been feeding, and Quint uses barrels on the Shark to slow it down. The idea is that if you fasten enough barrels to the animal, it will eventually tired itself out. But the shark is twenty five feet long, and it’s either really smart or really dumb, and so it knows to attack their ship. All the while, the tensions between the crewmates escalate. And though Quint may come across as a little bit insane, he has his reasons, which is why when Brody feels like they need more help, he destroys the radio. But the shark does enough damage to their boat that eventually they run out of options. For me, Jaws was the film. I saw it on ABC when I was about seven, and it did something to me. It made me love movies – at first I thought I was interested in sharks, but it was Jaws that made me want to watch movies. And some thirty years later I still find things to love about the movie, and I still get breathless at the conclusion. It’s a part of my movie DNA, but I still can’t get enough of it. And this Blu-ray is one of the great restorations for the format. The clarity of image is impeccable. Though the film doesn’t need its 7.1 DTS-HD remix (which comes alongside a DTS-HD 2.0 Mono mix), the remixed soundtrack is never overt in trying to take a film that was originally Mono and make it sound like a modern thriller. But it’s the presentation that sings. The film had a lot of trouble while shooting getting matching light, and this transfer does some work to make shots match, but that’s one of those things I would and probably will never notice because I always get caught up in the moment. As of now, this is the Blu-ray release of 2012. Universal presents the film in widescreen (2:35:1) and in DTS-HD 7.1 Surround and 2.0 mono in the best presentation of this film has ever had on home video. The film also comes with a DVD and Digital copy. The supplements kick off with deleted scenes and outtakes (14 min.) many of which were used in TV cuts of the film. Then there’s the making of (123 min. ), which was done for the laserdisc special edition, but it is a truly definitive behind-the-scenes look at the making of the film, and gets everyone from Spielberg to Scheider and Dreyfuss, to writer Cartl Gotlieb, the film’s producers Richard D. Zannuck and David Brown, and more on record and there’s ton of great story and anecdotes included within. It’s so good that ‘The Shark is Still Working: The Impact and Legacy of Jaws” (101 min.) feels like it tries to find something else to say about the film, which means interviewing the guy who did the voice-over for the trailer, and many of the townsfolk who were featured in the film. It’s not terrible by any stretch, but with so much of the film explored better, this feels like a collection of B-side interviews. There’s a piece on the restoration (8 min. ), and the work that went into this release, while “From the Set” (9 min.) is a 1974 featurette on the making of the movie. There’s also four still galleries for Storyboards, Production photos, the marketing, and the phenomenon, and the set concludes with the film’s theatrical trailer.